A Child of Books is one of the most beautiful books I have ever had the pleasure of reading. It is an absolute masterpiece in concept and design. On the surface it appears to be just another lovely picture book but delve deeper and you will soon uncover a magical world where words and images collide to create a magnificent piece of art. 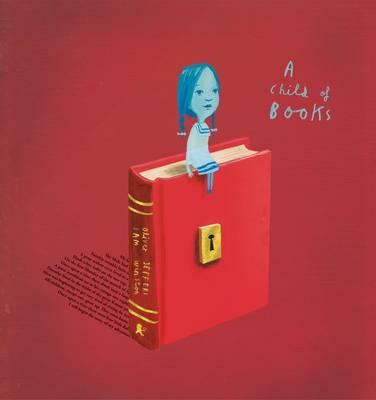 A Child of Books is the story of a young girl who sails her raft across a sea of words, arriving at the house of a small boy and calling him away on an adventure. Through a forest of fairy tales and across mountains of make believe, the two travel together on an amazing journey that unlocks the boy’s imagination. Now a lifetime of magic and adventure lies ahead of him. A Child of Books features lovely words and elegant images by Oliver Jeffers, along with Sam Winston’s typographical landscapes, shaped from excerpts of children’s classics and lullabies. It is a stunning prose poem that pays homage to the history of literature, based on the stories and influences that impacted the creators. See how many excerpts of children’s classics and lullabies you can find intertwined in the illustrations. It’s difficult to express how truly lovely this book is. There is nothing else like it on the market. It is a beautiful, timeless treasure that I thoroughly recommend to readers of all ages.